aheinecke added a subtask for T4458: Certificate certifications: T4389: Gpg4win 3.1.8.
aheinecke changed the status of T4458: Certificate certifications from Open to Testing. aheinecke claimed T4458: Certificate certifications. Thanks for the report. Indeed I can also reproduce it with my own key. For signatures from expired / revoked / disabled keys it shows "No public key" because GnuPG returns the same error in that case. We can fix that by looking up the key ourself. JW-D added a comment to T4451: OpenPGP Smart Card decription / private key not found. By installation from version 2.3 an error occurred, I´ll send you a screenshot by e-mail. However, I have some comments to the current version which may also help: I have three keys, two on smart cards and one on a Yubikey. So long as only smart cards are used, it is no problem to change between the cards and they work fine. Problems occur, if a Yubikey comes in. (i) Not always a Yubikey is recognized by pressing F5. (ii) It the Yubikey is recognized and next a key from a smart card is needed, a computer restart is required. It was possible to change from smart card to Yubikey with the command. However, if the Yubikey 5 NFC was recognized, the only way to change back to the smart card was a restart of the computer. FabioCarpi removed a project from T4458: Certificate certifications: Bug Report. FabioCarpi created T4458: Certificate certifications. aheinecke closed T4411: Outlook O365 crashes at start with gpgol as Resolved. Unsupported protocol still means something with your GnuPG installation is strange. Whats surprising me most here is that Kleopatra works for you. 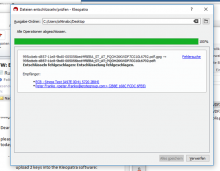 aheinecke added a comment to T4451: OpenPGP Smart Card decription / private key not found. I'm interested if this works as you imagine with 2.3 I'm pretty sure werner worked on a problem like that. 2.3 Release plan is around this summer. There will be a public beta sooner. Kleopatra recognizes the smart card, shows the correct version number and keys in the "smart card - management" window. In the Keylist I can´t find the key. Currently GnuPG 2.2.15 is installed. Do you know then version 2.3. will be released? aheinecke triaged T4451: OpenPGP Smart Card decription / private key not found as Normal priority. For Kleopatra there is a "TODO" to better handle multiple smartcard readers. E.g. that you can have mutliple tabs in the smartcard management view. aheinecke closed T4438: Kleopatra: 3.1.6 external gpg process calls call gpgsm instead as Resolved. aheinecke added a commit to T4438: Kleopatra: 3.1.6 external gpg process calls call gpgsm instead: rKLEOPATRAbf9aab0b567d: Fix copy&paste error that breaks gpg process calls. aheinecke renamed T4438: Kleopatra: 3.1.6 external gpg process calls call gpgsm instead from Kleopatra: 3.1.6 failure to refesh OpenPGP keys to Kleopatra: 3.1.6 external gpg process calls call gpgsm instead. aheinecke created T4438: Kleopatra: 3.1.6 external gpg process calls call gpgsm instead. aheinecke closed T4264: Gpg4win 3.1.6, a subtask of T4089: Kleopatra: Remove ASCII Armor checkbox for private key export, as Resolved. aheinecke closed T4264: Gpg4win 3.1.6, a subtask of T4266: Kleopatra: trusted-certs not imported when importing from X509 Keyserver, as Resolved. aheinecke closed T4264: Gpg4win 3.1.6, a subtask of T4373: Generating new key pair, as Resolved. aheinecke closed T4264: Gpg4win 3.1.6, a subtask of T4390: Kleopatra: Fall back to included filenames for files without extension, as Resolved. aheinecke closed T4390: Kleopatra: Fall back to included filenames for files without extension as Resolved. aheinecke added a commit to T4390: Kleopatra: Fall back to included filenames for files without extension: rKLEOPATRA84c4d2bc0bd6: Show embedded file name if it differs. aheinecke changed the status of T4390: Kleopatra: Fall back to included filenames for files without extension from Open to Testing. If the filename embedded in the encrypted message differs from the filename Kleopatra uses (which is derived from the file system filename) Kleopatra will now show the filename. This should cover the case where users receive an "Attachment.pgp" and do not know what that is. aheinecke added a subtask for T4390: Kleopatra: Fall back to included filenames for files without extension: T4264: Gpg4win 3.1.6.
aheinecke created T4429: Kleopatra: Offer to generate ECC keys on Smartcards which support it. aheinecke triaged T4423: Change passphrase error as Normal priority. Can you open the command line (cmd.exe) and execute there: "gpg --passwd 6B05B09F" ? 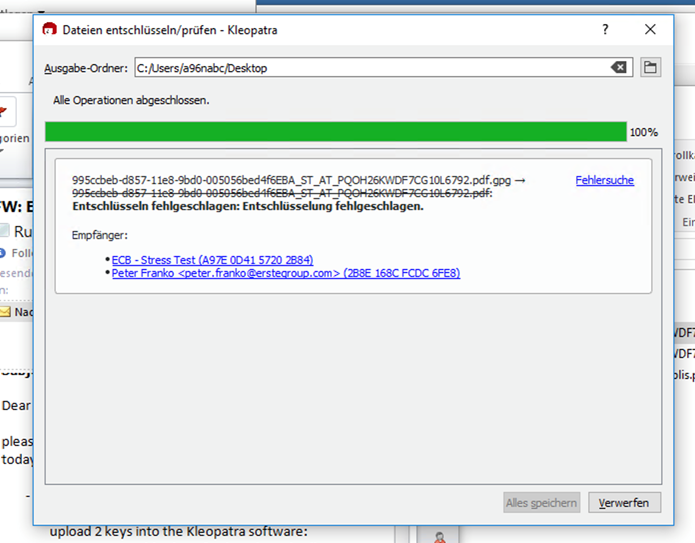 aheinecke closed T4149: Kleopatra OpenPGP and GpgSM self test fail after installation on Windows 7 as Wontfix. sarahw65 added a comment to T4149: Kleopatra OpenPGP and GpgSM self test fail after installation on Windows 7. I've recently moved from the Windows 7 system where I saw the problem to a Windows 10 system where Kleopatra works. As Windows 7 will no longer be supported by Microsoft, there seems little point in working on this issue, so I'd be happy if it was closed as Won't Fix. FabioCarpi created T4423: Change passphrase error. thome added a comment to T4411: Outlook O365 crashes at start with gpgol. "OpenPGP Encrypted message (decryption not possible) Could not decrypt the data: Unsupported protocol" error. aheinecke triaged T4411: Outlook O365 crashes at start with gpgol as Normal priority. 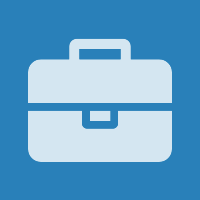 aheinecke added a comment to T4411: Outlook O365 crashes at start with gpgol. This is very strange, common to all the crashes in the log is that they happen while a keylisting is running and before the first key from that keylisting is returned. But this could be a red herring because the keylisting is always started immediately in a background thread and so it would be normal that if the crash occurs immediately that it would still be running. The keylisting code is extremely similar to Kleopatra though. So I don't understand why Kleopatra would then work for you. Since I configured call tracing the running O365 Client dies immediately after activating the addin. Same happens now if I activate the addin. Anyways, here is the log. Thanks for the report. Log looks not unusual. thome created T4411: Outlook O365 crashes at start with gpgol. aheinecke added a comment to T4038: Kleopatra: Improve handling of MDC errors. KarlS added a comment to T4038: Kleopatra: Improve handling of MDC errors. I'm new here, therefore I'm unsure whether this posting is correct at this position. Within my organisation we have ongoing troubles with the error described here, with windows version 3.1.3 there is no such button "force decryption" as documented here. huowen added a comment to T4395: Kleopatra: Missing error handling when changing expiry. i am sorry. it really wasn't a high priority Bug, I just want to get your attention（^_^）. aheinecke added a comment to T4395: Kleopatra: Missing error handling when changing expiry. I'm not sure yet where the bug lives. It's either in GPGME's editkeyinteractor that ignores the error / cancel or in Kleopatra itself. I'll have to look into it. Btw. I do not think that this should have high priority because it is not a new regression and while it is a Bug and wrong it is not really harmful. aheinecke added a comment to T3990: Kleopatra change expiry date on year doesn't work. I've opened T4395 for this to keep better track of it as this task was about another issue. aheinecke claimed T4395: Kleopatra: Missing error handling when changing expiry. aheinecke created T4395: Kleopatra: Missing error handling when changing expiry. huowen added a comment to T3990: Kleopatra change expiry date on year doesn't work. huowen raised the priority of T3990: Kleopatra change expiry date on year doesn't work from Normal to High. Hi，aheinecke。my kleopatra version is "kleopatra Version 3.1.4-gpg4win-3.1.5".and when change expiry date, i enter a wrong passphrase or choose "cancle". it shows successfully. what can i do for solve this question. thanks. aheinecke created T4390: Kleopatra: Fall back to included filenames for files without extension. aheinecke added a commit to T4066: Kleopatra, performance: Use icons as a resource: rWe06c325a9a29: Use binary variant of breeze. aheinecke merged T4366: GPGME Key Generation Error into T4373: Generating new key pair. aheinecke closed T4089: Kleopatra: Remove ASCII Armor checkbox for private key export as Resolved. The dialog is improved and simplified now.